A transnational alliance has called for a day of action on Feb 6th to struggle for the demilitarisation of the borders, the freedom of movement and global justice. On Feb 6th 2014 at least 15 migrants who wanted to reach Ceuta had been killed by Spanish Guardia Civil. 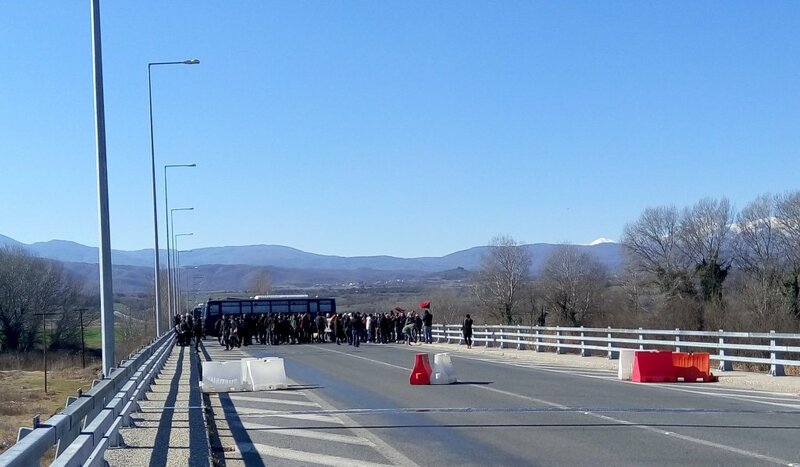 Solidarity networks have called for a protest in Idomeni as well, but were intercepted by the police on their way to Idomeni and surrounded by massive riot police presence. Massive police presence at the petrol station as well. Greek authorities seem to be very afraid of any kind of events that could provoke protests and uprisings in the fragile equilibrium of strict control, forced waiting and hopes of transit that pervades the border area. 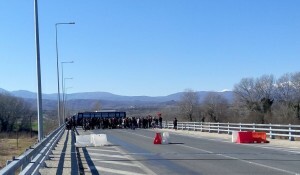 Meanwhile the border was closed temporarily during the day, some groups of people were let trough. Some buses could leave the petrol station, but still many people report to live there now for four days.